Is Mitch Larson Door County’s Busiest Man? Mitch Larson, owner of On Deck Clothing Company, brings his Sister Bay roots into his stores, and his boundless energy to everything he does. Photo by Len Villano. Mitch Larson always seems to be in a rush. At the grocery store, walking the sidewalk in front of one of his stores, or darting in and out of the gas station. His friends say it’s not uncommon to find him with a box of Special K cereal and a carton of milk on his desk, the result of a breakfast skipped when he arrived before dawn. Even his emails are blunt, leaving few keystrokes wasted. As On Deck Clothing Company began its 30th season, Larson wasn’t slowing down, and his hands were in more places than ever. The day we spoke he was energized by the opening weekend performance of his new location on the west side of Sturgeon Bay, his ninth retail concept on the Door Peninsula, and second in Sturgeon Bay. He also operates three concepts in Fish Creek, and four in Sister Bay, all selling casual resort wear, but each with different lines and focuses. That’s nine different concepts open all day, spread across four locations — an unconventional approach to retail in a place where the busy season is actually just a few weeks for most retailers. But for three decades, Larson has operated his stores outside Door County norms, an echo of generations of his family that have done the same for the last century. Larson grew up in Sister Bay, the son of Harold “Wink” Larson, an intrepid entrepreneur and prankster who gave Al Johnson his first goat, Oscar (making Al possibly the luckiest prank victim of all time). 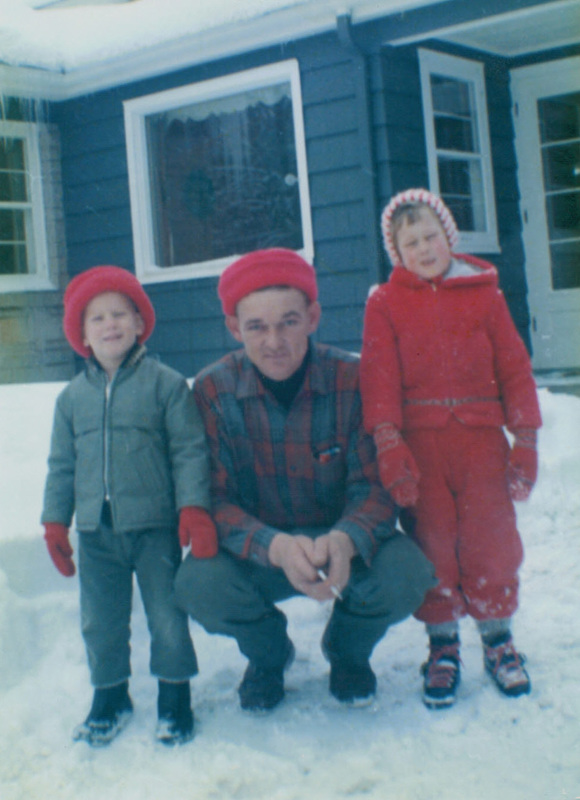 Wink Larson ran a summer fish boil, owned an orchard, and in 1959 opened Nor-Ski Ridge, a small ski hill south of Fish Creek embedded in the memories of a generation of Door County residents. Wink and Al Johnson were best friends, and Mitch soaked up their entrepreneurial traits as he nipped at their heels, as well as the heels of his grandfather Bill Bunda, who owned the Sister Bay Bunda’s, then his uncles Jack and Bill Bunda, who operated stores in Sister Bay, Fish Creek, and Sturgeon Bay. Wink Larson (center) had his hands in several business ventures, a trait that rubbed off on his son Mitch (left), pictured here with sister Lisa. In some cases, their lessons are mirrored directly in Larson’s actions. That left an impression on Larson, and when he made the riskiest move of his career in 1997, purchasing two properties in the center of Fish Creek, the first thing he did after signing the closing papers was walk inside and turn all the lights on. So now, whether you drive into Fish Creek at 11:00 pm in the middle of July, or at 8:30 pm on a desolate December Tuesday, you’ll come to the bottom of the big hill on Highway 42 and see the windows of On Deck Clothing lit up. Mitch Larson’s stores in Fish Creek never go dark. Photo by Dan Eggert. It’s one of many strategies that sets Larson’s stores apart. The extreme seasonal nature of the economy makes most business owners skittish, leading to inconsistent hours, service, and quality in pursuit of the perfect hours and days to make it worthwhile to stay open. Larson takes the opposite tack. Since 1997, one of his Door County stores has been open all but three days a year — Christmas, Thanksgiving and Easter. Jacobs calls Larson one of the best managers of his business that he’s ever met. Larson is skilled at identifying his employees’ strong points and recognizing his own. On Deck buyer and manager Mert Larsen says one of those strengths is his attention to detail. Larson still does most of the buying for On Deck, and it’s common to see him at the door of his stores early in the morning, loading boxes into a trailer to move product to different locations. Larson has a sixth sense for knowing when a product will move at one store while it will languish at another. 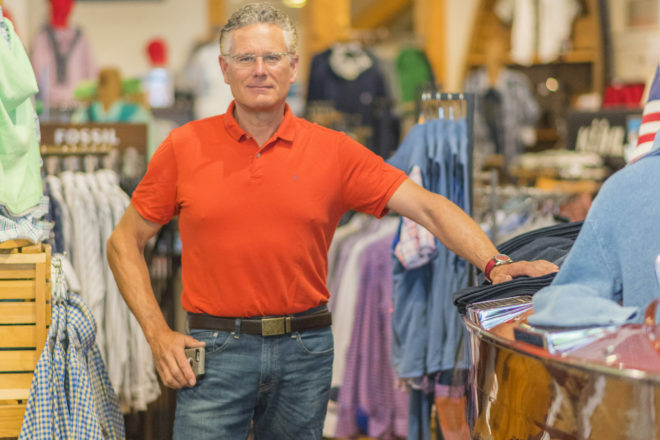 John Ostran introduced Larson to the clothing business in the mid-1980s, when he had a small boutique store behind Al Johnson’s. Soon the two were business partners, opening their first store in the Top of the Hill Shops in Fish Creek in 1986, selling a few lines of men’s sportswear. Larson still worked primarily in the cherry processing business, but after a couple years it was clear that On Deck required more time and energy, and with Ostran working as a baker and cook at Al Johnson’s Swedish Restaurant, he decided to sell his share to Larson, who poured himself into On Deck. 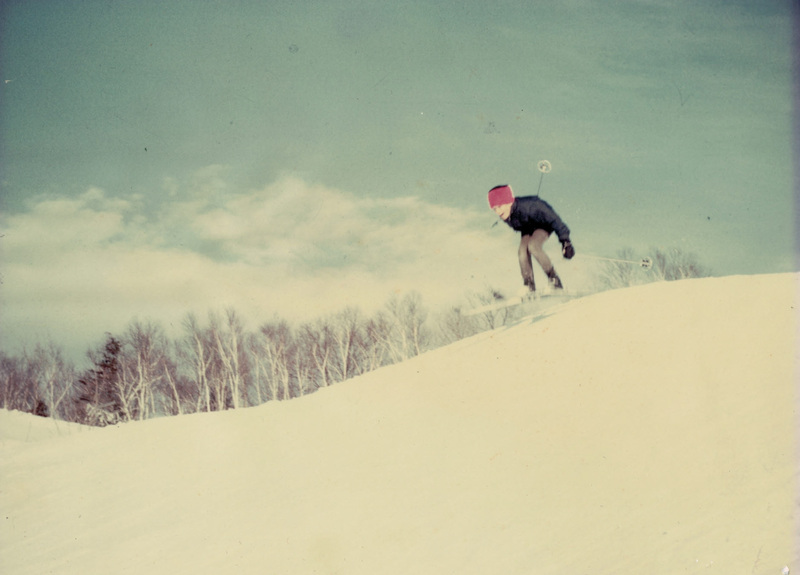 Mitch Larson gets some air at his father’s Nor Ski Ridge hill in Fish Creek in the 1960s. Years later, Larson opened a sportswear store, no doubt influenced by his time on the hill. Larson opened a new store in Egg Harbor’s Main Street Shops in 1990. His business steadily grew, with a new shop in Sister Bay in 1995. 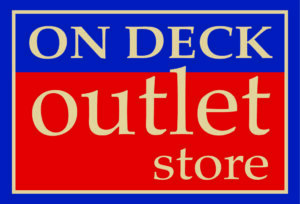 But business exploded when he bought his flagship locations in the center of Fish Creek in 1997. The corner of Highway 42 and Spruce Street was a grocer’s corner, with the Alwes grocery store and the Fish Creek General Store owned by Gary and Anne Norz. Larson bought the whole corner, remodeling the buildings but retaining the historic look of the buildings in their new incarnation. Alwes became On Deck Clothing Co., but the general store stayed as a grocery, with a focus on specialty foods. Mr. Helsinki’s, a restaurant with an urban appeal, was installed upstairs. In 2006 he went for location again, opening a new store on 3rd Avenue in Sturgeon Bay, then again in 2008, when he moved his Sister Bay store to the Village Exchange building, the same building where his grandfather kept the lights on late decades earlier. It’s now a much bigger, much different business than the one Larson started strictly as a men’s store with a few clothing lines in 1986. “People exercise, they dress better, and they want to look younger,” Larson says. “We carry clothing for the 18 – 35 year-old market, but also the 50-year-old who wants to look like they’re 35.” He also added women’s clothing, which now makes up 60 percent or more of his business. “His buying philosophy is based on the idea that an entire family can come to On Deck [from mom to grandma to girlfriend and brother — basically anyone from age 18 to age 80] and find something unique,” Larsen says. On the verge of his fourth decade in business, Larson is still nervous each spring, when all of his choices from the previous year are judged by his customers. Each spring he does staggered closes of his stores throughout the county, cleaning every store down to the bones and emptying the shelves. In that way, at least, Larson is just like every other business owner in Door County.